Work on Star Citizen continues, and if it’s been a while since you’ve seen it up close and personal, you can hop into the pilot’s seat for free this weekend and check out what’s new. Through Monday, Cloud Imperium is holding a Free Fly weekend to mark Gamescom. 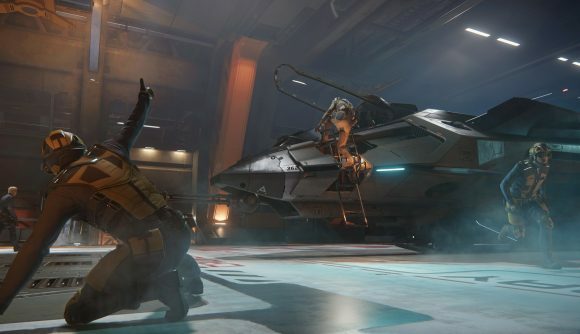 Should you decide to go for a spin, you’ll be able to see the Star Citizen Alpha 3.2 build teased during the PC Gaming show at E3 earlier this year. The update adds a new ship weapon, several new personal weapons for FPS gunfighting, new flyable ships, and the new MISC Prospector, an industrial ship that figures into Star Citizen’s new mining feature. To get signed up, you’ll have to follow a few steps. First, head to the Gamescom Free Fly page at Roberts Space Industries. There, you’ll have to either sign in or ‘enlist’ by creating a profile. Once you’ve done that, find the three-step section and use the Gamescom coupon code found on the page, and click “apply coupon.” Then, Step 3 will unlock and you can start downloading Star Citizen. Star Citizen players have created a video that shows off some of the game’s latest additions and features, and it’s worth a look if you’ve ever been curious about what it’s all about. During the Free Fly weekend you can pick from four ships: there’s the Drake Cutlass Black, the Aegis Avenger Titan, the Drake Dragonfly hoverbike, and the new MISC Prospector mining vessel. Sure, it’s possible to spend a lot of money on Star Citizen, and it’s been in development for quite a while. But free is always nice, so dust off the flight suit and have a look around this weekend. You can play until Monday without spending a dime.